Okay, sorry I complained about boring days. 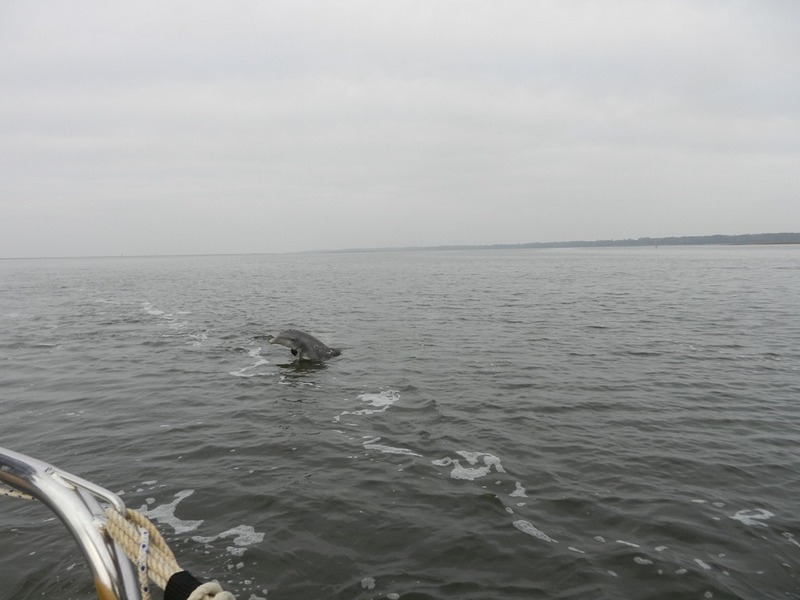 Today we ran aground, got a dynamite dolphin picture and were boarded by the USCG. Aground!!! We heard chatter on the radio of thin water at mark G19 in the Jekyll channel. The boats ahead of us said to stay on a range, which we did. But I didn’t turn off the ranges when I cleared the green mark – and we stopped – no bumpf, we just stopped. Reverse didn’t help. A boat right behind us stopped to help, took a tow line and got the line stuck in his prop just as he ran aground ahead of us. 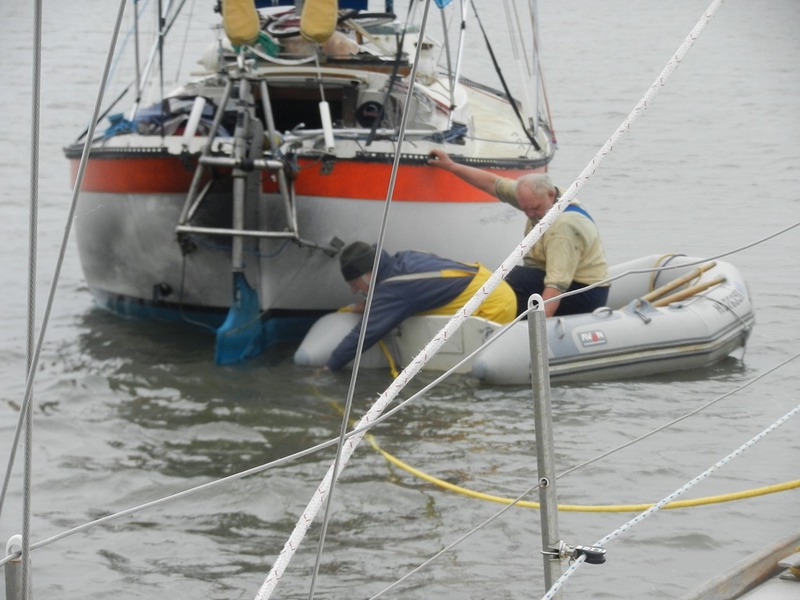 We launched the dinghy and Goldwin helped him untangle our yellow tow line. Whew!!! By the time he passed by, the tide had come up enough for us to just power off and continue south as if nothing had happened at all. Except that Goldwin lost his hat – see it in the picture? I think he needed a new one anyway, but he misses it terribly. 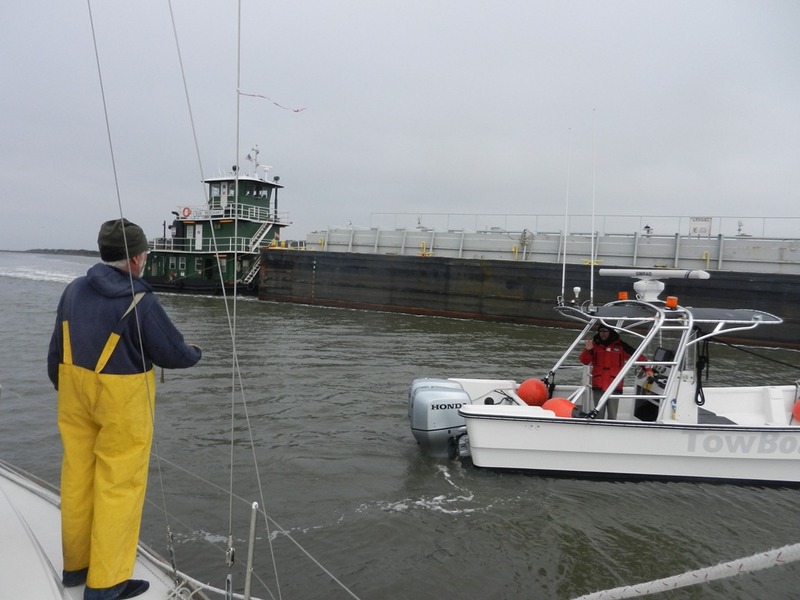 A little further down, just before Cumberland island, the USCG decided to board us and conduct a safety check. They try to put their boat right onto yours, but we insisted on separating them with bumpers to protect our lovely new paint job. They were undiplomatic enough to point out that we already had a scratch on our paint job – thanks USCG, for reminding us. Anyway, two came on board – why do they always have muddy boots? We had to open up the engine compartment and show them our fire extinguishers, life jackets, documentation, drivers’ licenses, and plaques. Do you believe part of the safety check is that we have posted plaques about the discharge of oil and the discharge of plastic? It is and we have them prominently posted on our boat. Very decorative. Complain, complain, etc. We were in a little channel trying to stay on ranges and chat with Coasties who were blocking my view of our depth sounder. Anyway, we passed. Pretty tough stuff, right? Hint: it’s a lot more impressive if you zoom in on it. I like to think this dolphin was apologizing for the Coasties, (who truthfully were very polite except for the one who reminded us of the scratch on our boat). Next stops: Cumberland Island and then Florida. Cool pic of the dolphin. Almost like you got it to pose …. Hahahaha. Was surprised to find it in my camera after madly clicking away. Fun. Great dolphin picture!!! What a busy day! Glad you are checking in on us – nice to hear from you. And happy to be out of the rest of it. Wow, sounds like quite a bit of excitement! Good thing you had those lovely oil and plastic notices displayed 😉 And such a beautiful picture of the dolphin! Thanks for sharing and save journeys! incredible dophin picture. What fun with the inspection. Maybe a little too thrilling with the barge ??!!! Where is the southern sunshine? Looks like a lot of cool, cloudy weather down there. Wish some would come out here. My daughter rightfully reminds us to be kinder to the USCG who saved the lives of 14 of their friends aboard Bounty.